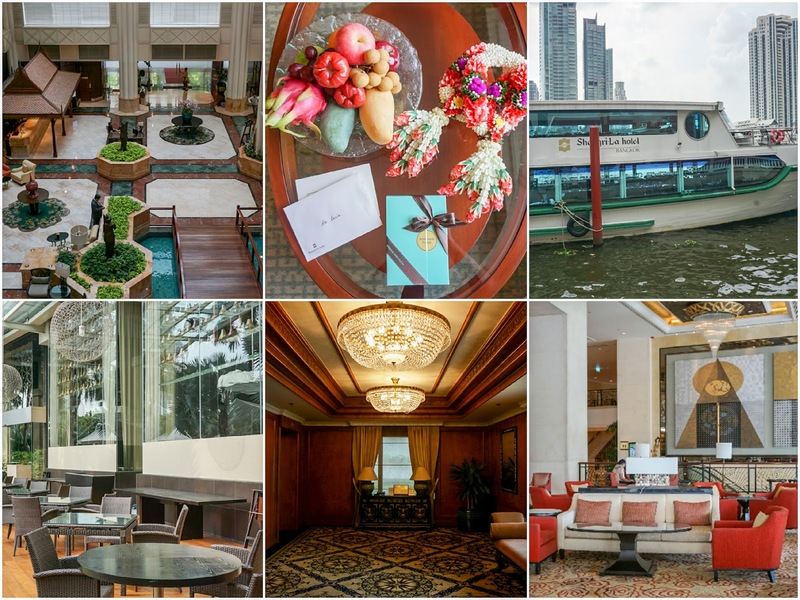 The largest hotel property along the Chao Praya river, with 802 guest rooms and a quarter of a mile of river frontage, it’s the hotel brand synonymous with luxury travel. You’ll find it in the central business district of Bangkok, between Silom and Sathon Roads, right on the banks of the Chao Praya river. It’s minutes away from some of the big attractions, and a 35 minute drive from Suvarnabhumi International Airport. The Shangri-La Hotel Bangkok design was original based on the valley depicted in the 1933 James Hilton novel, Lost Horizon, and built by a Japanese architect firm. Then, from 2001-2002, it underwent a huge renovation costing US $17m. Public spaces and rooms were designed by Wilson & Associates, including the colonnaded marble floored lobby, featuring sculptures by Thai artists. 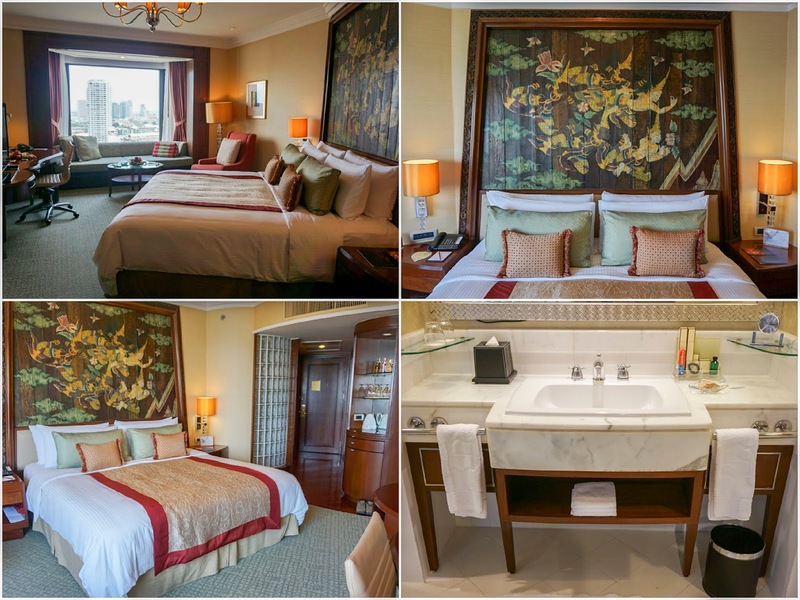 The property’s guest rooms are split across its two adjacent towers – the Shangri-La Wing and Krungthep Wing. In them, expect decorations in the classic Thai style designed by Wilson & Associates, including elm burlwood panelling and carved Thai motifs. The Krungthep Wing has more privacy, even boasting its own private butler service. The standard rooms are compact and an unusual shape, thanks to the curvature of the front of the building. But the space is used very well. The swimming pool is on the river front, adding significantly to the majestic airs. 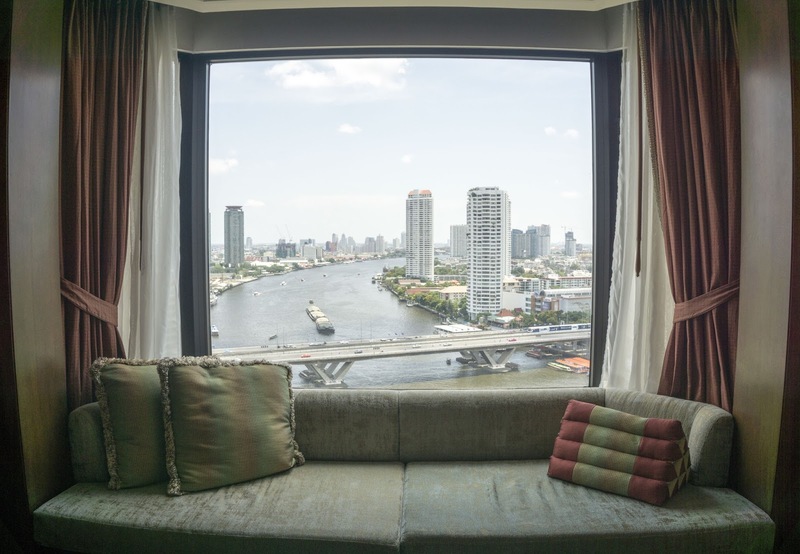 In 2014, the Shangri-La Hotel Bangkok joined the Bangkok Riverside Marketing Partnership (BRMP), a group of eight five-star hotels on the city’s riverside with a pledged 150 billion baht investment in the area in January 2015. Which is great for local communities. The hotel uses solar panels to generate some of its power, saving 2.7m baht a year (about US $77,000). Oh, and they have a helipad, should your chosen method of transport require one. I found out some interesting insight about the visitors. 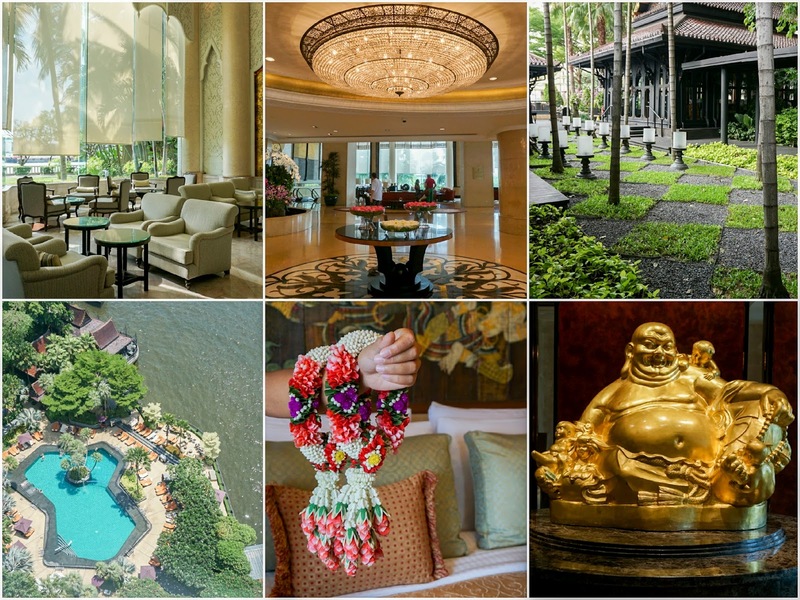 The Shangri-La Hotel Bangkok hosts about 30 weddings a year, and they are looking to specifically target the Indian market, who seem to be following a trend of getting married in Thailand. I have two Indian friends myself who have recently done just that. About 30% of the guests are there for leisure, and around 50% are on conferences, coming in big groups, accommodated by the 20 function rooms. 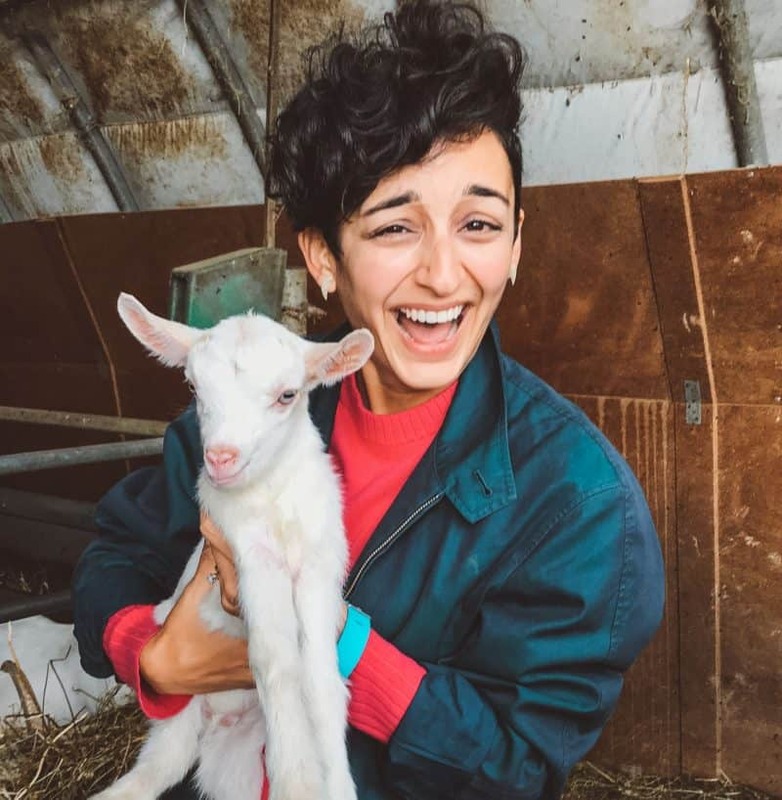 And while the hotel is aimed at couples and business travellers, families seem to feel equally at home, with Sunday brunch offering activities for kids, a clown and a magic show, and a kids buffet. Served in the bright and airy all-day buffet dining restaurant Next2 Cafe – one of the nine drink and dining options available within the Shangri-La Hotel Bangkok (one of those includes a restaurant on board their private river cruise ship!) – and recognising their diverse client base, it’s an international offering. Expect the usual impressive spreads of breads and pastries, even pumpernickel bread. There’s both an egg station and noodle station making your dishes of choice to order, the likes of potato wedges, gravy, oatmeal, dim sum, baked tomatoes, creamy spinach, char siu bao, fresh energizing fruit and vegetable shots, and a lot more. 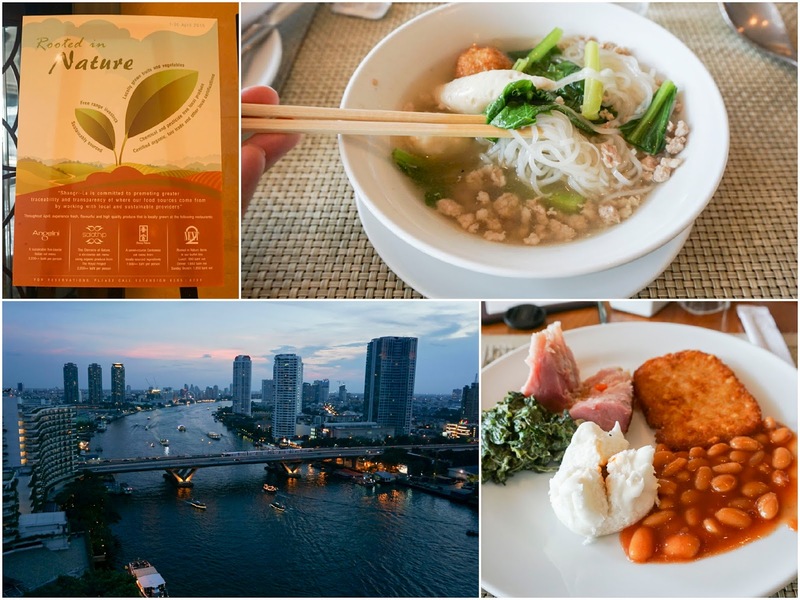 It’s also worth noting that by 2017, the Shangri-La Hotel Bangkok expects 50% of all its menus to be sustainable. 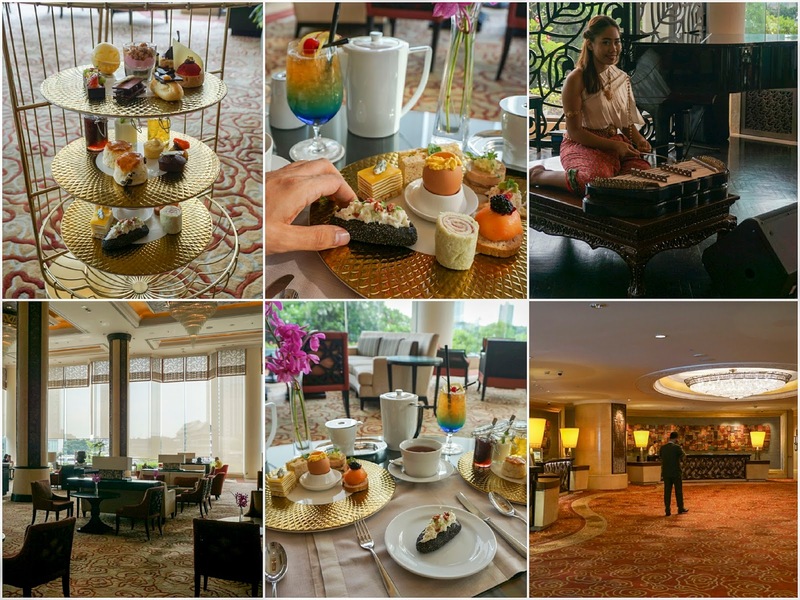 The Shangri-La Hotel Bangkok offers no less than six restaurants, including an Italian, a very popular Chinese known for its excellent dim sum, the all day buffet Next 2 Restaurant and the classic Thai fine dining experience Salathip, directly on the river. The Upper Deck bar is a great place for a pre-dinner drink, either indoors or out, and the Chocolate Boutique in the lobby is a paradise for sugar addicts. The nightly jazz and pop is best enjoyed from a comfy stool in the Long Bar. The Shangri-La also has its very own dinner cruise ship, the Horizon, which sets sail nightly at 7.30pm with an international buffet on board. And afternoon tea delivered in a golden birdcage is pretty cool. In the set you can expect bites like Alaskan King Crab, charcoal and poppy seed baguettes with crisp pancetta, and foie gras torchon with pheasant rillette, port wine jelly and caramelised apples. It also includes the almost luminous and award-winning Blue Paradise mocktail from Thailand’s Dilmah Real High Tea Challenge 2014. I received an exceedingly warm reception on arrival, before my details were taken. Not to mention the garland of flowers and very lovely fruit platter in the room. I noticed the staff seemed genuinely happy, team members laughing with each other and with guests. Service and warmth was impeccable all round, from a very caring team. You get given towels and cold water at the pool, and there’s a free river boat to pop guests over to the night market if they fancy a visit. Plus, there’s unlimited access to over 2,000 digital newspapers and magazines in 60 languages. You can walk straight to the BTS train from the hotel, only having to leave the building for a few seconds to cross the road. Very convenient. The room was a little smaller to other Shangri-La properties I’ve experienced, such as the Shangri-La Hotel in Chiang Mai, but still entirely delightful none-the less. Prices from £140 for a deluxe double to £260 for an executive suite, including breakfast.